Life expectancy in 2040 is set to rise at least a little in all nations, but the rankings will change dramatically, with Spain taking the top spot while China and the United States trade places, researchers said. 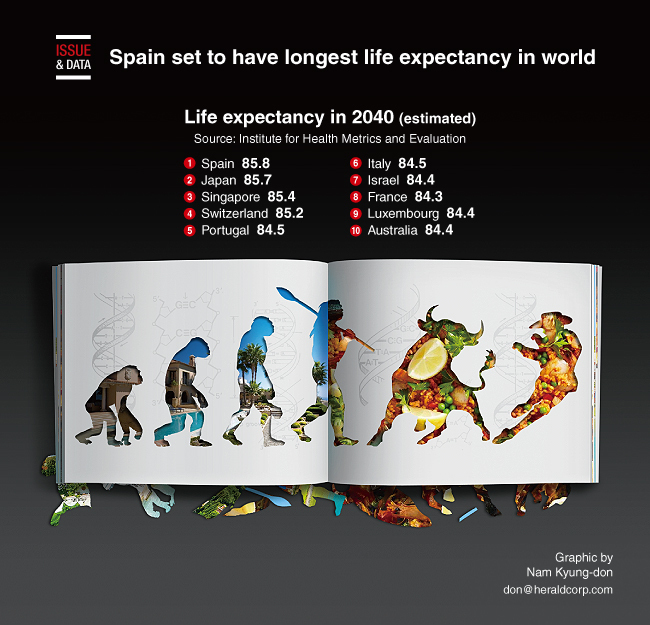 With a projected average lifespan of nearly 85.8 years, Spain - formerly in fourth place - will dethrone Japan, which sits atop the rankings today with a lifespan of 83.7 years, and will drop to second place in 2040. In a shift that will be seen by some to reflect a superpower changing-of-the-guard, the world's two largest economies effectively swap positions compared to 2016: In 2040 the US drops from 43rd to 64th (79.8 years), while China rises from 68th to 39th (81.9 years). For the world as a whole, the researchers' study projected about a four-year gain in lifespan, from 73.8 in 2016 to 77.7 in 2040.